Over the course of the test, Jay reiterated what was being tested at each level. As he did, my respect for the sport grew. My rough summary – white belts know individual techniques, blue belts put it together, purple belts can make it flow, and brown belts must be able to teach. The natural progression of learning to teaching makes perfect sense to me. And the emphasis on teaching shows that the sports values things beyond strength and technique. Along with giving back and helping the next round of students, teaching is one of the best ways to learn. Much like many other of my BJJ first experiences, I found the testing process both interesting and a little intimidating. The levels were tested in order and the testers stood up when their level was being tested. Several people even tested for two stripes, one after the other. In most cases a fellow tester was your training partner. It made for an interesting match up when my 15 year old buddy Tony (5′? ?”) was paired with a very solid older guy named Stan (6+’, bones possibly made of cement). The trainers point to a tester and call out a technique. A quiet and supportive audience of fellow athletes surrounds the mats. There is no direct feedback on your performance during the test. You won’t know until afterward if you’ve made a mistake. At the end of all the testing, the trainers privately discuss each performance and decide whether the person passed or failed. Three mistakes is a failure. When they emerge from their conversation, they call up each tester and ask them if they’d like to fix anything. ** It’s a risk because doing something wrong could add to your errors. After the testers make any corrections, they receive feedback and learn if they’ve earned their stripe. Hint: a trainer quietly ripping off pieces of athletic tape is a good sign. From the outside, this may seem like a brutal practice. Some sort of show of machismo, that you can battle fresh fighters coming at you basically every 20 seconds. But if that’s what you see, you are missing the point. It’s not a test of bad-assery, it’s a test of attitude and gameness. They aren’t expected to have great technique or to even make an opponent tap. They just need to keep going, keep engaging, never give up. No bad attitude, just do the work. And all those dudes (and occasionally women) waiting to pounce aren’t trying to mess you up. They are being supportive. They’re testing you, not letting you off easy by any means, but they are absolutely on your side. The best example I saw of this came in the first tank for the blue belt. He was exhausted and beginning to struggle. I don’t think he would have quit but it was obviously getting very difficult to keep going. One of the purple belts literally called out “You can do it, get up!” while leaping on top of him. Verbally lifting him up while physically knocking him down. How’s that for a dichotomy? That was just one moment of many. Each tank felt like it lasted for an hour instead of a few minutes. It probably felt like an eternity to the testers. People were cheering and challenging the men on the mats the entire time. 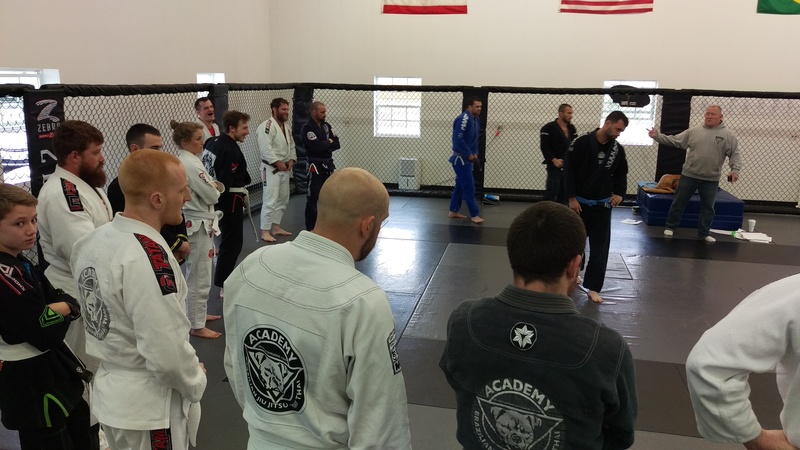 Sharks getting a taste of the purple belt testers. It was a great experience for me to watch the test. I left feeling both excited and terrified for when it was my turn to be the tester. But I know the fear will dissipate (at least a little!) when I’m ready to test and, as always, I’ll have an amazing community supporting me along the way. Sadly, in leg related news, I have not yet been cleared for “impact exercise.” The doctor, trying to be helpful, said I could participate in the non-contact portions of training. To which I replied “You mean the warm-ups?? ?” I know I’d be tempted to join class when the warm-ups were over, so I’m skipping it for now. It’ll be August before I am ready for action. I plan to stop by and keep in touch with the community in the meantime. If there is another test before I return, you can bet I’ll be there, cheering along. If the test is soon after I return, perhaps I’ll be in my gi, jumping into the tank – knocking someone down and building them up. 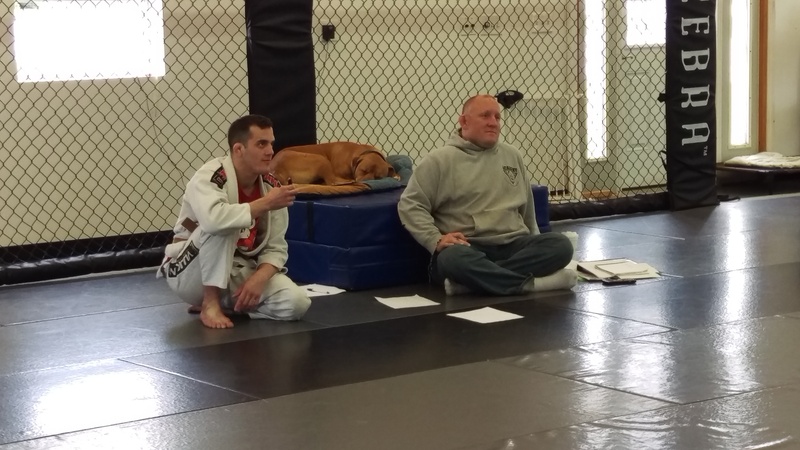 * – Update: I have since learned that this process is not standard among BJJ gyms. Many gyms do not use tests for stripes or do not test at all. Promotions are given by merit instead. ** – Update: As of September 2017, Jay has removed the “what do you want to fix” portion of the review. He felt people were becoming too dependent on it.